Day 55, we wake up with a brilliant idea for making pancakes: on the paella pan, over the fire. It works brilliantly and we are thrilled. It’s good fuel for crossing the border into California. We follow the Adventure Cycling Association route into Crescent City, which routes us off Hwy 101 along winding, scenic, backroads. The day is sunny and beautiful. In Crescent City, we try to find the AAA office to get maps, only to learn that it has recently closed. Fortunately, there is a National Parks Information Center and they give us great maps of the Redwoods area, including a few secret tips for getting off the main road. We ride around town looking for a coffee shop with wireless internet, but are completely unsuccessful (apprently they’ve all closed too? ), and we end up charging batteries in front of Safeway instead. 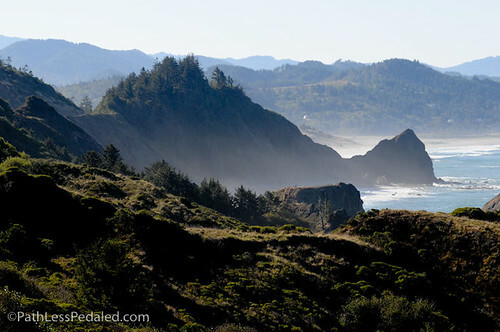 From Crescent City, we ride up Elk Valley Road to Hwy 199 to Jedediah Smith Redwoods State Park. 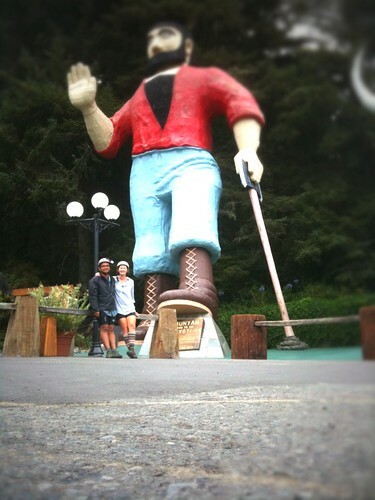 We’re treated to a surprising and delightful downhill through the redwoods that takes us all the way to the campground. We get a hiker/biker site, at the far end of the park, away from the other campsites, along the river. We are the only cycle tourists here tonight, but there are two girls next to us who have hitchhiked from Seattle. Bear boxes are provided and we stick all our stuff in them, just to be sure. We sleep in a bit on Day 56, knowing that our mileage will be short. We’re determined to make use of our entire $8 bundle of wood, so we have abreakfast fire and make more pancakes. 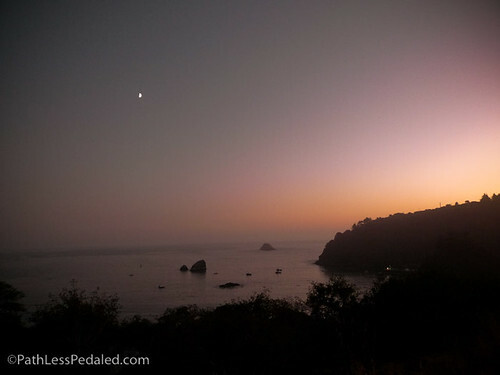 We decide to take the dirt road through the redwoods to Hwy 101, instead of going back along the route that we took into the park – and we are treated to an amazing ride. The surface is hard-packed gravel, extremely ridable. Cars rumble slowly down the road to look at the trees, but RVs and trailers are forbidden, so it is quiet and highly enjoyable. For the second time, on a gravel road, I hit a bump and one of my front panniers flies off. This time, I am fortunate that nothing breaks. I strap it on with a bungee and we roll down the rest of the hill. When we hit Hwy 101, it is a long climb ahead of us, with virtually no shoulder. Most of the time, drivers are polite and simply pass in the other lane. A few people honk. One dumptruck comes way too close. I ponder how much money it would take to fund an interurban bike trail, off the road, for all the cyclists that explore the area. 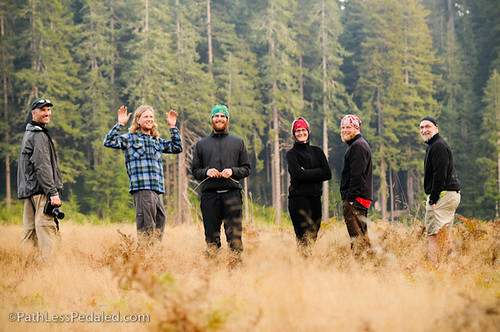 A few miles north of Klamath, we pull off at the Redwoods Hostel for the night. We have heard that this hostel is constantly ranked one of the best in the world, and we decide to check it out before it closes (permanently, unless they can get the funding to retrofit it for earthquakes). Day 57, we’re up early so we can spend a bunch of time online at the Forest Café down the road (the closest internet). The Forest Café is across the street from larger-than-life statues of Paul Bunyan and Babe the Blue Ox, so many many photos must be taken. (For what it’s worth, breakfast at the Forest Café was excellent and a steal!) We roll through a few small towns on the 101, stopping only to get groceries, then turn off onto the Newton B. Drury Scenic Route. 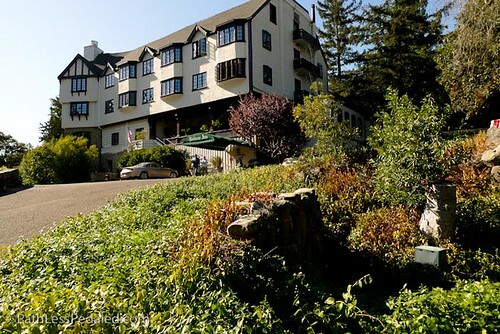 It kicks off with a good climb, but then you’re rewarded with miles of downhill, followed by many more miles of a gradual downhill trend that lets you just coast and coast through a dense forest of redwoods. In a word… amazing! (And worth all the stress of being on the busy coast route.) We pull in to the Hiker/Biker camping at Elk Prairie Campground and meet up with many of the same tourists we met back up the road a few days earlier… so there’s a big reunion! And then we all stand in the grass at the edge of the prairie and watch the elk across the field (and all the crazy people who get out of their cars and walk way too close to take a photo). All through the night, we hear the sounds of male elk fighting just a few hundred feet from our tents. Day 58, I am startled when I wake up by the Nixon mask hanging on the tent of our neighbor (a through-hiker who later tells us that it’s to help ward off evil spirits!). We roll out of camp, with fingers crossed that the elk will be out. When we see a bull standing in the grass, we stop… and then the second bull comes out of the woods and crosses the street… and we wait… and after a half-hour, we’re rewarded by a National Geographic special in front of our eyes! Russ snaps a few hundred photos, while I test out the video capabilities of my little point-and-shoot camera. After they’ve sparred for awhile and back off from each other, we get back on the saddles and roll down the road. In the little town of Orick, we stop at a small Mexican restaurant for coffee and an amazingly huge breakfast burrito (yum!). We’re also delighted to get cell phone service for the first time in days and thumb through all sorts of messages. We take an afternoon break at Patrick’s Point State Park, and I pull out my studio and work on some jewelry. Then we head down to Trinidad, where we meet our gracious host for the evening. We get a tour of the little town and enjoy an amazingly delicious dinner. Thanks Mary! On Day 59, we get up early and devour some bacon and eggs for breakfast, before heading into town for groceries and photos. We take the scenic route out of Trinidad (literally called Scenic Road). 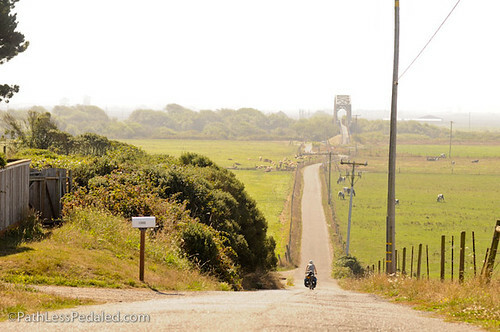 We follow the ACA bike route, which routes us onto the Hammond Trail out of McKinleyville and into Arcata. If you’re going through here, check out the Hammond Trail! It’s a rail-to-trail conversion and you get to ride across an old rail bridge and through beautiful farmland. One stretch cuts through a cow pasture. Delightful. In Arcata, we stop for coffee and contemplate where we’re going to stay for the night. Just as we’ve decided to make do with the KOA down the road, we meet Daruka, a reader of this site, who graciously offers up the futon in his place. We happily accept and spend a relaxing afternoon catching up with some details and washing some laundry. Thanks Daruka! Day 60 (two months!! ), we hop back on the 101 (now a two-lane, busy freeway), and book it down the road. Coffee in Eureka, lunch in Fortuna. And then we luck out and catch and strong tailwind out of Fortuna that pushes us up and over a few hills in the unseasonally high heat. We meet Turner, a cycle tourist making his way around the US, after starting in Florida many months ago. Russ helps re-true his front wheel and we all ride together for a stretch. 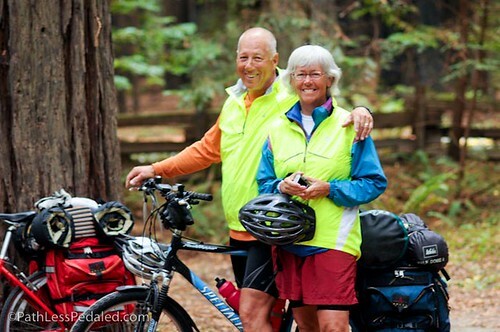 We follow the Avenue of the Giants (through Humboldt Redwoods State Park), stop for sodas at a small grill in Redcrest, then push on to Burlington Campground, where we share a Hiker/Biker space with Jim & Jane of Bandon, OR (heading down to California wine country). Day 61, we take our time getting up, make pancakes and try to figure out our plans for the next few days. We decide to leave Burlington (we had originally thought we’d stay two nights) and head down the road. We have mail waiting for us in Garberville and Russ is eager to pick it up and try it all out. In Garberville, we’re stunned by the number of hitch-hiking hippies (apparently in town for a festival over the weekend). One local tells Russ that we’re obviously not hippies, we’re on bikes, so we must be more motivated. 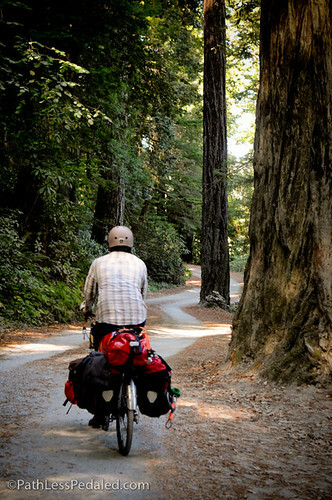 Hmm… We load up the bikes with groceries (and begin to rethink our food packing system) and head down the road a few miles to Richardson Grove State Park. Over the course of the afternoon, we meet up with Jim & Jane, followed by Victor & Jane, then Tom & Chris. Another reunion! We stay up late laughing, since we know we probably won’t cross paths again. Day 62 is a rest day for us. We hang out in Richardson Grove, listening to the new radio (that gets amazing reception!). I work on some jewelry, Russ works on the bikes, we hear about the tsunami in Samoa and wonder if we’re on high-enough ground and far-enough inland (even though the radio peoples tell us there’s no chance of it hitting the west coast). After feeling very out-of-touch with current events, it’s nice to hear the latest news as it breaks, while catching up with a lot of stuff that we’ve felt very behind with. Day 63 is another rest day… and we take advantage of a gift certificate that was re-gifted to us for a night’s stay at The Benbow Inn. We check in early and realize how much we can appreciate being indoors now. I take a long bath and we sip some (complimentary) sherry… before picking up some Cup ‘O Noodle at the only market around (at the RV resort across the highway), because we’re feeling too lazy to ride up the very steep hill into Garberville and too cheap to splurge on dinner at the hotel restaurant. So we laugh at the irony and then check out the cable TV and sink into the very, very comfortable king bed. Been wondering how you guys are! Also wondering how the radio is working for you? A bike tourist review maybe? Cheers and am still watching your progress! Nice pictures. Great artistic skill felt in that. I’ve ridden that route almost exactly, but on my motorcycle. Jedediah campground is a really nice large but really well laid-out campground and the forest cafe is truly good. Lots of food! Love this area and hope to go back someday. We’re delighted that you both enjoyed your stay at the Benbow Inn. Enjoy and have a safe trip. We hope to see you in Yosemite. Lots of love to you both. You guys are in one of my favorite parts of the world. Enjoy the coast and the redwoods. There’s nothing else like it. -an ex-Californian now living in Wisconsin. Ha, picking up the Cup O’ Noodles is great! Glad you guys made it to my hometown, and even had a host! 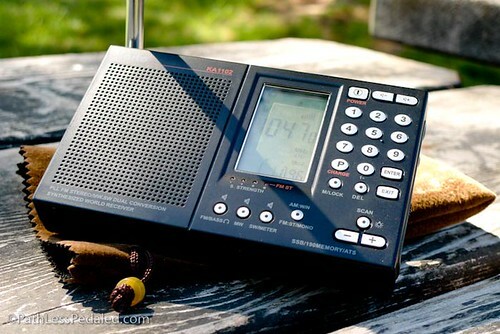 What model is that SW radio? Looks like a good one. Bikes down Howland Hill Rd. seems like the ultimate. I generally explore off-trail, but almost bought a folding bike last year, just to take to the redwoods for that road, and Drury Parkway. Maybe I’ll replace my mountain bike.